Applications: For fibre backed sanding discs for use on angle grinders. Also ideal for semi-flexible discs. Product Notes: The back-up pads are the same size, or slightly smaller than the sanding discs to avoid gouging. 100mm pads have M10 threaded mounting, whilst all others have standard M14 mounting. A choice of hardness is offered. All work with any grade of sanding disc, but a hard pad (H) will give better cooling when grinding under pressure with coarser grade discs. These have 'turbo' style cooling fins to keep the sanding interface as cool as possible. The medium (M) hardness is a good all-rounder and will give a bit of flexibility, which may help with finer finishes. The softer (S) flexible pads will help reduce gouging when fine finishing or working on curved surfaces. 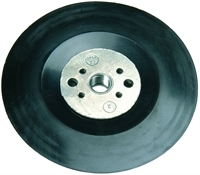 Also Available: An extensive range of fibre sanding discs for use on these back up pads.